Variability of Indian summer monsoon droughts is investigated by computing all-India drought indices namely Percent of Normal Precipitation, Standardized Precipitation Index and percentage area of India under moderate and severe drought conditions. Observations for recent decades, post 1960, exhibit declining trend in monsoon rainfall with frequent occurrence and intensification of droughts along with an increase in percentage of area under moderate and severe drought conditions, in association with variations in sea surface temperature (SST). 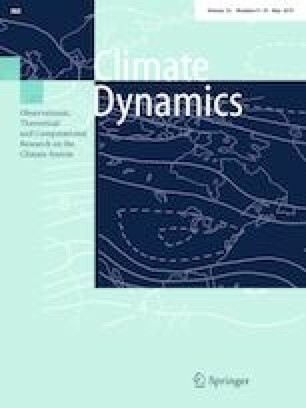 Historical simulations from CMIP5 models suggest that two models, ACCESS1.0 and INMCM4, could well simulate monsoon rainfall variability, particularly the frequent occurrence of droughts and spatial variability of rainfall during drought years in recent historical period (1961–2005). Future projections of all-India drought indices from these two models indicate frequent droughts during near and mid future (2010–2069) with respect to the recent historical period. Intensification of severe droughts for near and mid future are suggested to be more pronounced over north-central India. The reduction in rainfall in the near and mid future is dynamically consistent with a westward shift in large-scale monsoon circulation, particularly the monsoon trough over South Asia. Interestingly, future projections of monsoon teleconnections indicate a weakening (strengthening) of in-phase (out-of-phase) relationship of all-India drought intensity with the equatorial eastern Pacific and the Indian Ocean (western Pacific) SST. Whereas, a strengthening of in-phase relationship between percentage of area under drought conditions and the equatorial eastern Pacific SST is projected for near and mid future with respect to the recent historical period. These drought features are consistent in both the models. The authors are grateful to Director, IITM, Pune for providing the necessary facilities to carry out this study. The authors are thankful to Dr. R. Krishnan, Executive Director, CCCR, IITM, Pune, for constant encouragements. Thanks are also due to Dr. N. R. Deshpande for the help provided in statistical analysis. We acknowledge the World Climate Research Programme’s Working Group on Coupled Modeling, which is responsible for CMIP, and we thank the climate modeling groups (listed in Table 1 of this paper) for producing and making available their model output. For CMIP the US Department of Energy’s Program for Climate Model Diagnosis and Inter-comparison provides coordinating support and led development of software infrastructure in partnership with the Global Organization for Earth System Science Portals. Figures in the manuscript are created using XmGrace and COLA/GrADS software. IITM is fully funded by the Ministry of Earth Sciences, Government of India.